Our baby bouquets are a creative alternative to traditional shower presents. Each is in essence a collection of baby socks or layette items assembled to look like a little bouquet. All the items used in their construction are of premium quality and made in the USA of the finest textiles. Being both decorative and useful, they are also fully appropriate to use as a centerpiece at a baby party. We even have a special baby sock corsage as a special adornment for the mom to wear! 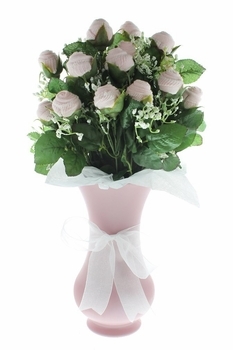 Each bouquet is guaranteed and includes free delivery too!